It’s all going to look splendid! 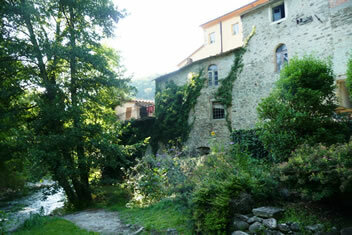 Spring is burgeoning here in Tuscany in the last few weeks before the beginning of the Watermill creative courses season. As ever, we are quietly confident, but slightly concerned that everything will be completely ready for our first guests at the end of April. The builders continue apace, now pointing the enormous façade of the mill facing the river and covering the red brick of the studio wall with a coat of stucco which will soon be coloured in the traditional Watermill mustard. It’s all going to look very splendid. At the beginning of the month the contractors began to put in the solar panels on the part of the studio roof facing the river, but we are still waiting for the solar tiles to arrive, which will be integrated into the roof of the 19th century mill. Lack of certainty on their arrival date is causing a little nail-biting. Our lovely knitting tutor, Sarah Hazell, also had to pull out of her course, because of family ill-health, but her place has been taken by the delightful Carol Meldrum, an inspiring knitter/crocheter from Scotland, who will be leading the group and guiding them through the projects devised by Sarah. There are more details about Carol and the course below. As we said, bookings have never been more buoyant and we are looking forward to one of the most brilliant seasons at the Watermill, with many new innovations for our guests to enjoy, such as the wonderful banqueting table in the communal dining room. Our total capacity is around 260 guests, so you can see we only have room for a dozen or so more. As in previous newsletters the latest availability is detailed below and, as we have said before, don’t be too disappointed if you find that a course you really want to come on is fully booked: there are often cancellations and if it is a course you really want, let us know and we’ll put you on the waiting list. By far the most popular Watermill blog and Facebook post last month was the one we made to welcome spring with some fresh paintings of daffodils by Watermill tutors, past, present and future. We make no excuse of reproducing them again, together with a timely shot of Tuscan spring flowers in our nearby Meadows. 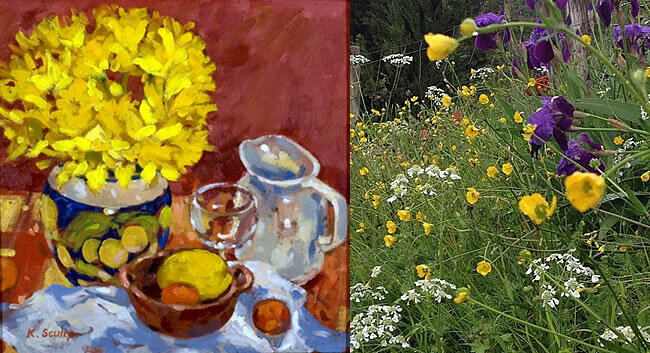 The picture top left is a watercolour of spring daffodils by a new Watermill tutor, Carl March, who will be with us in 2020, while top right is another daffodil study by Paul Talbot-Greaves, who is joining us again this may. At bottom left is a glowing oil of daffodils and fruit, by Kevin Scully, who will join us again as a tutor in 2021 (you see what careful, long-term planning goes into our Watermill creative courses!). At bottom right is a photograph of spring flowers in a meadow near the mill. Why not bring your friend or partner? They don’t have to participate in the course, but they will be able to enjoy the wonderful hospitality of the mill and, whenever they want, to come out with you to our beautiful locations. We also offer a range of Alternative activities for partners on all our courses, as well as a generous £GBP 250 discount if they share a room with you. 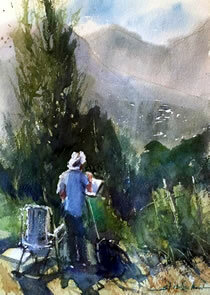 Here’s a watercolour by our friend and tutor Sandra Strohschein of John, one of our guests on her painting course here last year, enjoying the tranquillity of the countryside around the Watermill and concentrating contentedly on his painting. 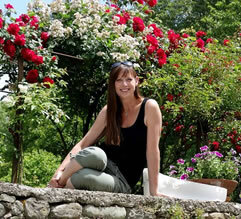 Sandra is with us for two weeks this year, but her courses are already fully booked. But as we say, there may well be cancellations. More details and links below. 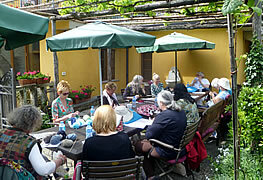 She will be with us again later this year, but, like Sandra’s, her course is fully booked. Again, there may well be cancellations and there are more details and links below. Incidentally, both Sandra and Maggie will be with us in 2020 and if you want to be among the first bookers for those courses, drop us an email and we will tell you more about dates etc. and even reserve your place! Do some detective work before you start to paint! Our talented and inspirational painting tutor Mike Willdridge stresses the need for a careful initial investigation of what you are going to paint. 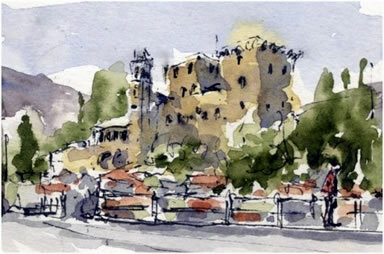 Mike says: “I always produce a small, usually quick and often tonal sketch before I embark on a finished piece of work. I’ll often draw more than I think I might need for a composition and, rather like a photographer composing a picture from a contact print, I’ll draw a box around the image I want. “I’m especially interested in the relationships between dark and light and I’ll therefore exaggerate the tones on my preliminary sketch. To me the sketch is like a black and white photograph, so I work my pen or biro hard over the whole image. “Taking time to study a particular subject and/or the sketches you have made or the photographs you have taken is a form of ‘investigation’. Mike will be with us this year from Saturday 29 June to Saturday 6 July 2019. We already have 11 people booked into his watercolour course, two of whom are non-painting partners, so we have room for one or two more. Why not come and carry out some painting detective work with us? There are links to more details in the section below. 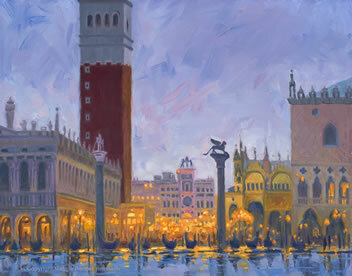 We still have a few spaces left on some of our inspiring painting courses. Others are currently fully booked, but if you would particularly like to come on one of them please let us know and we’ll put you on the waiting list. We do sometimes have cancellations. On the other hand, to be sure of a place on a Watermill painting course, why not choose one of our other inspiring tutors on whose courses there are still places? 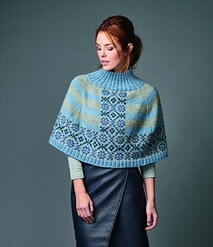 Carol picks up our dropped stitches: come and knit them together with her! Carol will work with you on a special project, another poncho, this one designed by her friend Sarah Hazell (above left), and she will also show you how designs like this can be altered for different heights, body shape, arm length and necklines. And there’s an additional mini-project, a knitted or crocheted corsage (above right), inspired by the Watermill’s gardens. Carol will be with us for a Knitting and La Bella Vita week from Saturday 4 May to Saturday 11 May and we have three or four places left. There are more details and links below. Come and pick up your stitches with us! 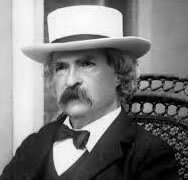 We like pithy one-liners giving writing advice, and no one was better at that than Mark Twain, whose tongue-in-cheek secret to writing success is chalked on the blackboard right. 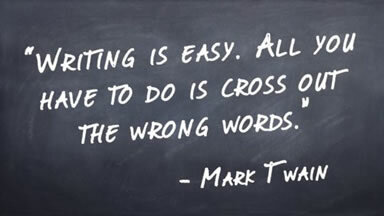 Those contemporary English Men of Letters, Laurence Marks and Maurice Gran, will undoubtedly be echoing Twain’s advice, since it applies just as much to scripts as it does to articles, when they join us for a unique Scriptwriting course at the Watermill this September. 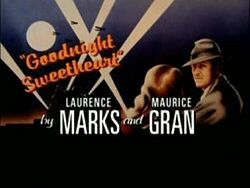 Laurence Marks and Maurice Gran are famous for such TV hits as Birds of a Feather, Goodnight Sweetheart,The New Statesman and Shine on Harvey Moon. And in a new incarnation, they’ve written hit stage musicals, such as Dreamboats and Petticoats and Save the Last Dance for Me, as well as film scripts and award-winning stage, TV and radio plays. It’s not just comedy: Marks and Gran are producing serious dramatic works as well. 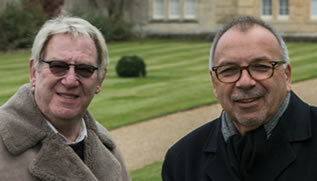 Laurence and Maurice’s course will show you how to craft your work from your original idea through structure, character, plot and finally, script. 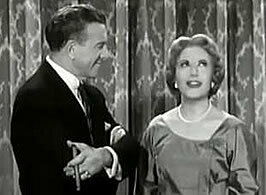 They will lead you slowly through what makes classic television comedy, using one-to-one tutorials, team writing sessions, and most enlightening of all, studying films and TV series that have become ‘classics’. They cannot guarantee success, of course, but they promise that you will leave the Watermill a considerably better scriptwriter than when you arrived. Che peccato for us, but buone notizie for you! 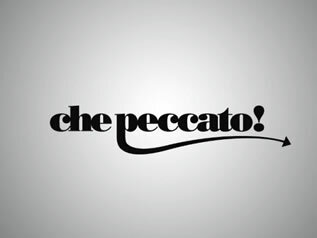 Che peccato, what a pity, two more of the people who were coming on our unique, week-long Italian Language course have had to cancel for health reasons. So, we now have nine bookings on this course (and will definitely run it). 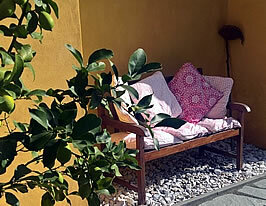 We have three bedrooms available: the Uccello, Gentileschi and The Lippi Suite. That means we have room for three more participants, and their non-participating partners if they’d like to come. So that’s the good news, buone notizie. We would be delighted if you could join us for this unique, inspiring week, where you will learn more about the delightful Italian language in an idyllic setting in the heart of rural Tuscany. 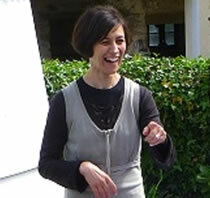 This year our old friend Francesca la Sala will be joining us again as the tutor. 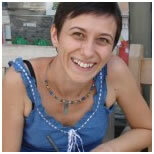 Francesca has been travelling all over the world in the last few years but is now back in her native Lunigiana and will be with us for another inspiring language course. You can join her, soaking up Italian and enjoying la bella vita italiana from Saturday 11 May to Saturday 18 May 2019.